Anne Taintor Holiday Travel Gift Giveaway! UPDATE: This contest is over. Lucky comment #16 is the winner. Congratulations Lisa Hardwick-Cillessen! Lisa’s tip: If waiting in a long line, talk politics. Somehow it always moves things along a little faster. Helps to talk blue politics in red states, red politics in blue states. If you’re loud enough, the people at the counter even seem to move more quickly. 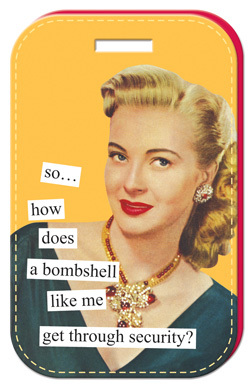 So…how does a bombshell like me get through security? I have no idea. What I do know is the oven isn’t the only thing I left turned on – in first class. I wouldn’t joke about something as serious as that. Hey, we’ve all got our baggage! Only mine is WAAAY better than yours! It is. Well at least it is now that I have a couple of Anne Taintor luggage tags hanging off the black plastic handle of my rolling crew bag! Jeez…what else did you think I was talking about? Since Anne Taintor and I were in the holiday spirit, we decided to team up and do a fun gift giveaway. I mean what traveler couldn’t use a little more fun in their lives? To enter all you have to do is share your best – or funniest – travel tip by Friday, December 14, 2012 and you’ll be entered to win a travel gift set from Anne Taintor. Winner will be announced Friday Afternoon. One of my favorite tips for the holiday is tearing out one of those perfume adds that are in all the fashion mags, and place them gently on top of your lamp next to your bed in your hotel room to help take away those miserable stale room smells. To avoid over priced tourist traps, don’t just ask for a place to eat. Ask a local what their favorite place is. I have so many travel tips it’s hard to pick just one but I guess my favorite one is to always have foil with you. If you do, you can heat up ANYTHING with an iron! Sometimes our hotels don’t have microwaves and if I have foil, I can wrap up any left over and use an iron to heat it up. I think this would have to be my favorite travel tip! When it doubt, you are ALWAYS on your honeymoon… upgrades and freebies galore! Oh boy… I’ve been meaning to write about that. Always bring a nightlight. Helps in unfamilar, dark rooms. Or in a bathroom, for those middle-of-the-night trips. When traveling with a baby, pack Ziploc bags to secure used diapers and contain their odor. I’ve downloaded a “sound machine” app. on my phone. It’s great for drowning out noise in hotels. Roll all your clothes up instead of folding flat – You can fit more in your suitcase that way surprisingly! We drive a lot for travel and stay in hotels. We now have certain things we bring with us, including bottled water and moist wipes. It is a huge help to have those simple things already with us when we check in. Add earplugs to go bag….helps with unexpected hotel noise. When I’m travelling for pleasure, I take time to research my destination. I love using TripAdvisor, and National Geographic Traveller has some fantastic walking tours (I personally used the Barcelona walking tour and was very happy). I also find bringing ziplock bags (variety of sizes – to avoid accidental shampoo/suntan bottle explosions, bringing home sea shells, packing muffins/snacks for outings), a pad of post-it notes and sharpie to be indespensable. A bad day travelling is still better than a good day at work. Go to the left for lines. That was our advice for visiting Disney, and it almost always works. People tend to go to the right, so go to the left for shorter lines. A quart sized zip top bag full of airplane bottles is just about right for a short flight. No waiting for service! if you mean liquor, not cool…and not legal to bring your own on a plane. I knit or sew my own luggage handle covers in the brightest, most gaudy colors and patterns I can find, and stitch them directly onto the bag. So not only can I see my bags from a mile away, they’re also too tacky for anyone to want to steal them. Best travel tip… when traveling with kids pack 4 times as much food as you think you’ll need on the plane. Last time I filled up a complete backpack of food. My hubby rolled his eyes at me. But when we were diverted to an air force base (yes, you heard that right!) he was thanking me! If waiting in a long line, talk politics. Somehow it always moves things along a litle faster. Helps to talk blue politics in red states, red politics in blue states. If you’re loud enough, the people at the counter even seem to move more quickly. Congratulations, YOU WIN! Send me your address and I’ll have Anne Taintor forward your holiday gift. I rely upon my electronic devices so I bought a rechargeable battery pack that can use multiple types of cables. I can use it to do emergency recharges of my iphone or my nook in the middle of the day when I’m out and about. I always roll all my clothing vs. folding — less wrinkles! Make sure to pack any necessities in your carry-on bag: spare undies and socks, your camera & battery chargers, makeup, spare shirt… You never know when you’ll spend two weeks in Europe and your luggage won’t show up. Bring your own travel blanket in your carry on for chilly planes and hotel rooms. There are nice jersey knit ones that come in little travel pouches. Convenient and cozy! Always have goodies in your purse…you never know when you are going to get stuck on the runway or in a hotel with an “Out of Order” vending machine and no room service!! This might sound weird, but for overseas travel, I usually pack underwear that is near the end of it’s life and toss it. Have also been known to buy good basic color T’s and tops when they are clearanced to rock bottom and toss those too. More room for things to bring back with the luggage restrictions. Mapquest the liquor store in the neighborhood where you are staying to avoid those costly hotel bar drink choices. I never leave home without my headphones – besides listening to music through them they are great noise reducers!!! 3 travel tips…1) always pack a few extra gallon size & quart size ziploc bags (very useful for many circumstances); 2) I always pack a wine opener; 3) for big trips that I know will be memorable, I choose a new lotion or perfume scent, that way whenever I encounter that scent in the future it will always bring back a wonderful memory of that trip. I love the scent tip! Never leave home without a small antibacterial spray. Hit up the remote, the light switches, door knobs and taps. Hotels are festering places and if you do any amount of regular travel, this is the only way not to pick up every single greebly bug floating around. When traveling overseas, don’t bring your own cold and pain medication. Because you can buy OTC medication at every supermarket and convenience store overseas, they’re all open 24 hours a day, it’s even easier to figure out what you’re buying in a foreign language than in English, and the active ingredients are exactly the same as we have in the US. Oh, wait. On second thought…. It seems like I always pack everything under the sun and then some! My advice is not to pack for the worst-case scenario and to pack your bag only two-thirds full to leave room for souvenirs and the inevitable doubling in size of your clothing. Pack shoes or breakables in cushioned mailers; use mailers to send back anything you don’t want to bring home with you. Get rid of excess weight–clean out your purse! Invest in a nice lightweight nylon handbag. You can carry it inside a much larger carry-on totebag that will also accommodate your book, snacks, camera, change of clothes, etc. When you get to your destination, you have a smaller, light handbag for sightseeing, restaurants, etc. Bring packets of EmergenC to consume on the plane, flight attendants will hook you up with some (hopefully) bottled water. My travel tip is to create a post-it list two days prior to your date of travel and include the items you use daily within the list. Cross off each item as you pack them and you won’t be worried about if you forgot anything. Hoping to win this for my gf this holiday season. Good luck to everyone! Always bring along a shawl for long plane trips, that way you can keep warm without having to use those nasty airplane blankets that catch on every tiny little hangnail you may have! When I travel, I always tie a super bright ribbon or some leopard print fabric to my suitcase so it’s easy to spot on the conveyer belt. Makes it easier to get in in and out of there when everyone is trying to get their things! I learned to use straws to put your necklaces in, so they don’t tangle all up. This is cool! Just cut the straw to fit the necklace length. If I ever forget my phone charger, I simply go to the front desk and tell them that I left my phone charger there the last time I was there. Chances are they have a whole box full of chargers left behind by people and usually let you sort through them to find one that fits your phone. When I leave, I just leave it in the room again! For longer trips, I always bring some end-of-life undergarments, sneakers, PJs, etc. I toss them and then have room for those items I purchased. My other must haves are a Swiss Army Knife and a Spork (combo spoon & fork). They are essentials for when you want to make a meal from a food market.